Blended learning as “third generation” of distance learning has the potential to offer multimethod instruction through the blend, to leverage the strengths of current online and traditional instructions. Therefore, higher education institutions having recognized the fact that blended learning is beneficial, adopted this alternative approach as a new educational delivery method. The study determined the difference in perceived learning among three different blended learning environments in Malaysian higher education institutions. The data were collected from three public universities in Peninsular Malaysia and the respondents were undergraduate students from these universities. The result showed that the students' presence in classroom meetings contributes to their learning. The results also indicate that high levels of perceived learning were reported by undergraduate student in the blended learning environment face-to-face meeting rather than online sessions. The advance of blended learning in higher learning institutions has been anticipated for years. For instance, in the United States, the blended learning programmes grew from 49% in 2003 to 56% in 2005 (Allen & Seaman, 2006; So, 2009). Moreover, in a research in 2003, 70% of participants predicted that more than 40% of higher education courses would be delivered in a blended format by 2013 (Bonk, Kim & Zeng, 2006). Furthermore, the results of a meta-analysis showed that interest in blended learning continues to increase (Means, Toyama, Murphy, Bakia & Jones, 2009). Additionally, Shea and Bidjerano (2009a, b) articulated that the number of student enrolment in blended learning is growing at a rate of ten times more than traditional face-to-face instruction in higher learning institutions. Based on Ambient Insight (2011) prediction, e-learning and blended learning industry income will reach 49.9 billion dollars in 2015. It has been predicted that Asia after America will become the second largest consumer of e-learning and blended learning products and services. Malaysia has been identified as one of the top three largest online markets in Asia (Ambient Insight, 2011). Clearly, with high level of online and blended learning growth, it is important that researchers continue efforts to understand many instructional challenges and complexity of teaching and learning process in blended learning environments. Therefore, based on the above statement, there are various blended learning environment, blended learning approaches, and blended learning models. According to Chew (2009), there is neither a standard nor simple stage-like model to blended learning in higher education for all disciplines and all institutions. Since, in different parts of the world, blended learning has been implemented in various formats higher education institutions. 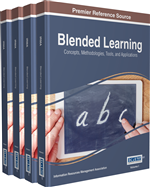 Blended learning is often personalized by different needs and requirements of individual, discipline or organization. Therefore, each blended learning environment has its own advantages, disadvantages, issues and challenges. Graham and Dziuban (2008) emphasized that different blended learning environments may have different effects on student’s learning effectiveness and cost effectiveness. Chew (2009) and Wang (2010) studied and compared different blended learning environments in various higher education institutions in order to obtain an overview of current practices in blended learning. Clearly, different blended learning environments have rendered learning more flexible and accessible and these activities have greatly enhanced learner autonomy and collaborative learning (Wang, 2010). Moreover, different blended learning environments have created new opportunities for students to have new learning experience (Vaughan, 2010). Currently, only a small (but growing) body of research is specifically comparing blended environments. In this respect, there is a need of more studies to focus on this area. Thus, the main focus of the current study is comparing different blended learning environments in Malaysian higher education context. Since students’ learning is a very broad concept; its application should be narrowed down. Students’ learning has many definitions including successful completion of a course, course withdrawals, grades, added knowledge, and skill building (Picciano, 2002). Using grades to operationalize students’ learning may not always provide the best results. As argued by Rovai, Wighting, Baker and Grooms (2009), grades particularly for higher education courses, tend to have very restricted ranges, such as uniformly superior achievement. Thus, there is a limitation of using grades in higher education studies. Additionally, as Corrallo (1994) indicated, the grades have little relationship with students’ output. Thus, there is a need to have other approaches to measure students’ learning.